We’d been thinking of this session as the natural follow-on from our “safety and taking electronics apart” session 3. We saved all of the (not fully) disassembled, end of life gadgets from this session: a netbook, a hairdryer, a drill, a hard drive, and a video camera. Students recognised them and felt reunited with them. In the interim they had become much more talented at disassembly and reassembly. Before launching into an “urban mining” session on raw materials and recycling, we went through some important concepts: that reuse always comes before recycling. We talked about the huge size of the secondhand market for electronics. The global market for secondhand smartphones is estimated at $17bn (Deloitte) – this is roughly equal to NASA’s annual budget for space exploration. 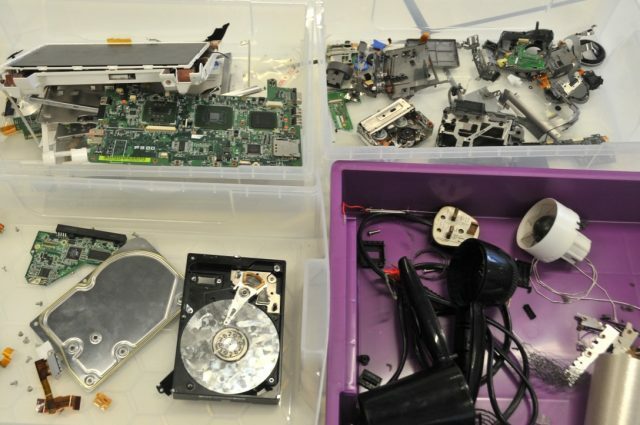 Reuse projects with Raspberry Pi sparked an interest – and we found the one Linux enthusiast in the group when we showed part of James Wallbank’s “Zero Dollar Laptop” Manifesto. Then we dove into the recycling and mining part of the session. Students knew most of the elements from the periodic table, but it was telling which ones they struggled to name: cobalt and tin among them. They were able to indicate where minerals were found in electronics, with some hints. 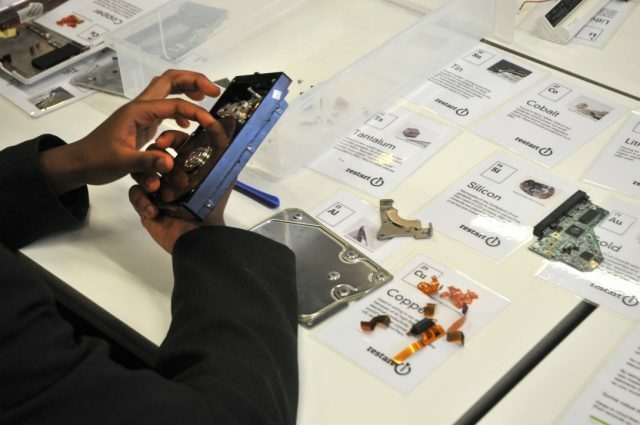 Then we encourage them – before tearing the disassembled electronics to bits – to identify if there were any reusable parts among them. The netbook keyboard, screen, memory and fan were all identified, as well as the drill’s battery pack and potentially its motor. The rest was taking the electronics even further apart. Students worked to identify the elements and minerals in the parts. It worked quite well. Gold is always a hit – people get quite excited to see it. We had to remind them that it is mostly gold plating.